​30 years experience in the underfloor heating industry. and all our cables come with a 20 year manufacturer's warranty. and are known for our blue ribbon quality control. We have been serving customers in South Australia for over 30 years. 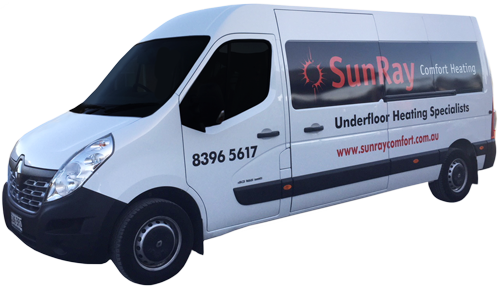 SunRay is the South Australian distributor and installer of the DEVI range of electric radiant heating products. The Danish company DEVI has been involved in the heating industry since 1942, is the most respected name in electric underfloor heating, and the global leader in the industry. The DEVI product line includes a comprehensive range of heating cables and controls which are made to Australian standards, with the heating cables carrying a 20 year warranty. We are a specialist and premium-quality radiant heating company installing systems which are safe, silent, odourless, economical and inexpensive, with no maintenance required. Individual electronic room thermostat controls and timers provide optimum comfort and efficiency. We have heating solutions for any application: domestic and commercial, single and multi-storey, for existing buildings or when building or renovating. If you would like to attach building plans to your enquiry, please email us directly.